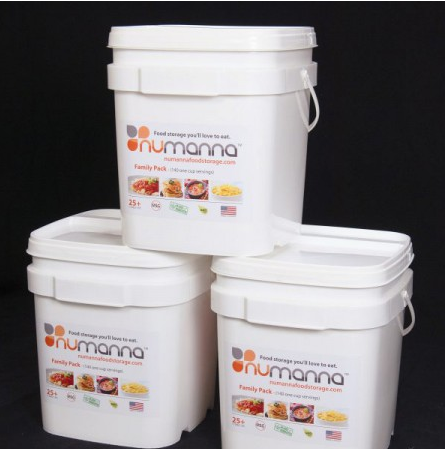 The Survival Kit is a great combination of NuManna’s exceptional products. This Kit provides over 850 servings of great tasting food. It includes one (1) NuManna Family Pack, one (1) 6-Pack of Hormone Free Milk Power Pouches, and one (1) each of NuManna’s new Diced Chicken Bucket and Ground Beef Bucket. Also included in the Kit are two (2) of NuManna’s revolutionary Defender Nutritive Packs that include Organic Grains and “Super Foods”. You are ready for an emergency with great tasting, nutritional food. And you can enjoy eating it today or years from now. This is the best money can buy. This Plan includes one (1) Family Pack, two (2) NuManna Defender Nutritive Packs, one (1) 6-Pack of Hormone Free Milk Powder, one (1) Ground Beef Bucket and one (1) Diced Chicken Bucket. The Defender Nutritive Pack comes with 126 servings of GMO-Free, Easy-To-Fix meals. But, what sets this store apart from the rest is the addition of 74 servings of Organic Grains and “Super Foods”. You can supercharge any meal with any of the grains/super foods. In times of heightened stress the body needs EXTRA nutrition. Plus, you get another 72 servings in necessary protein with your chicken and beef buckets. The 240 servings of Hormone Free Milk Powder keeps for at least 10 years and tastes great. Each Family Pack with meat bucket contains a total of 146 Servings (126 Lunch/Dinner servings, 30 Breakfast Servings).